Christians are in themselves no wiser than are other men. What they have they have by grace. They must be ‘all things to all men.’ But it is not kindness to tell patients that need strong medicine that nothing serious is wrong with them. Christians are bound to tell men the truth about themselves; that is the only way of bringing them to recognize the mercy, the compassion, of Christ. 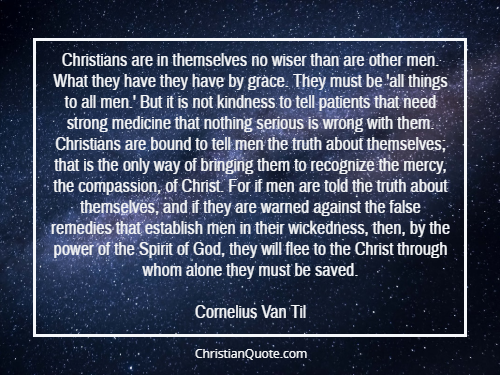 For if men are told the truth about themselves, and if they are warned against the false remedies that establish men in their wickedness, then, by the power of the Spirit of God, they will flee to the Christ through whom alone they must be saved.